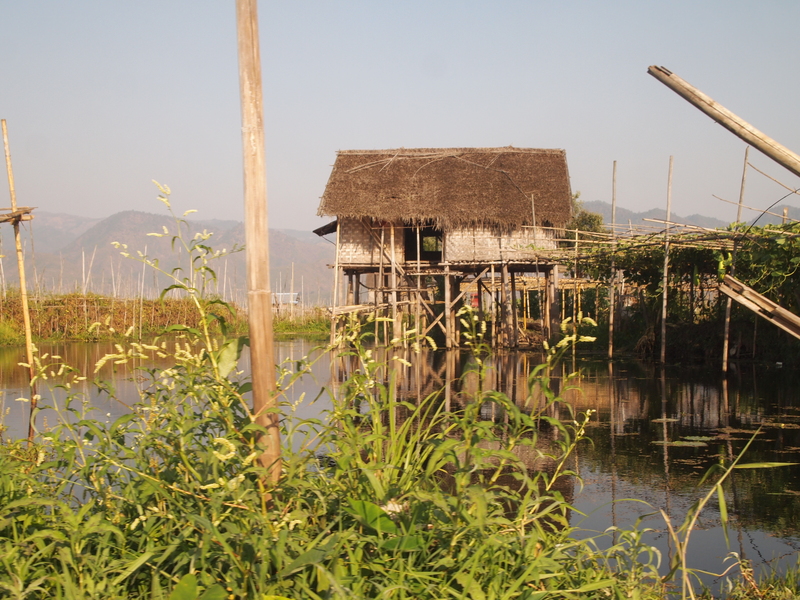 Sunday, February 22: I whiz back into Nyaungshwe on my bicycle, feeling pretty good after the flight of wines at Red Mountain Vineyard. 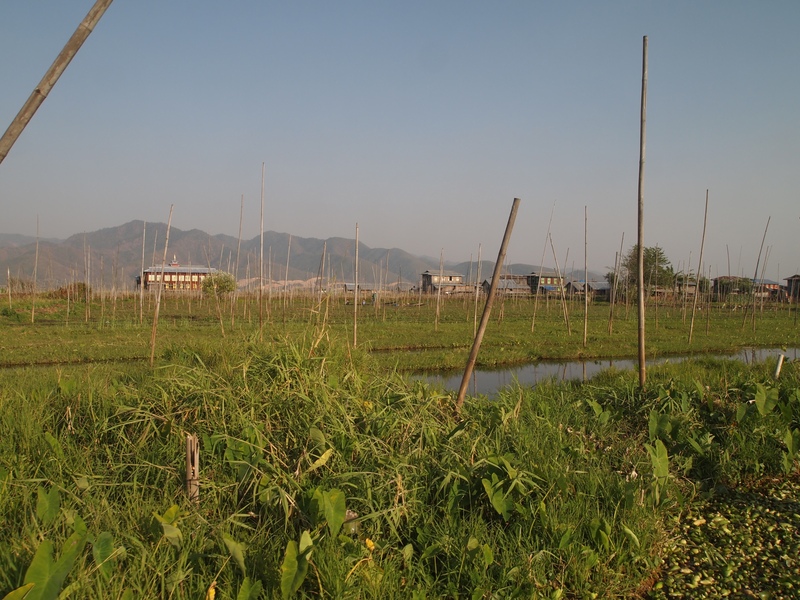 Although it took me a while to find my way TO the winery, I was able to remember the route back quite easily, despite feeling a bit loopy. 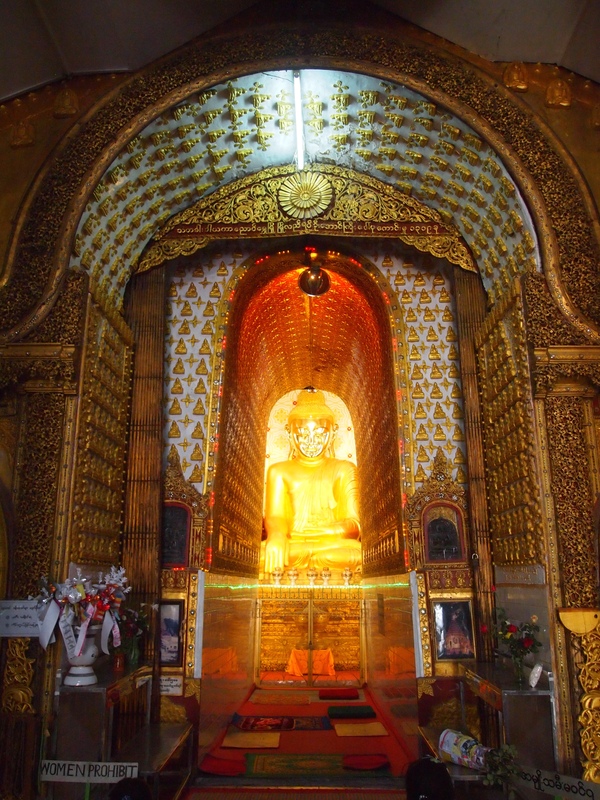 🙂 Earlier, I had seen the Yadana Man Aung Paya not far from my hotel, so I lock my bicycle at the entrance and go in to wander about. 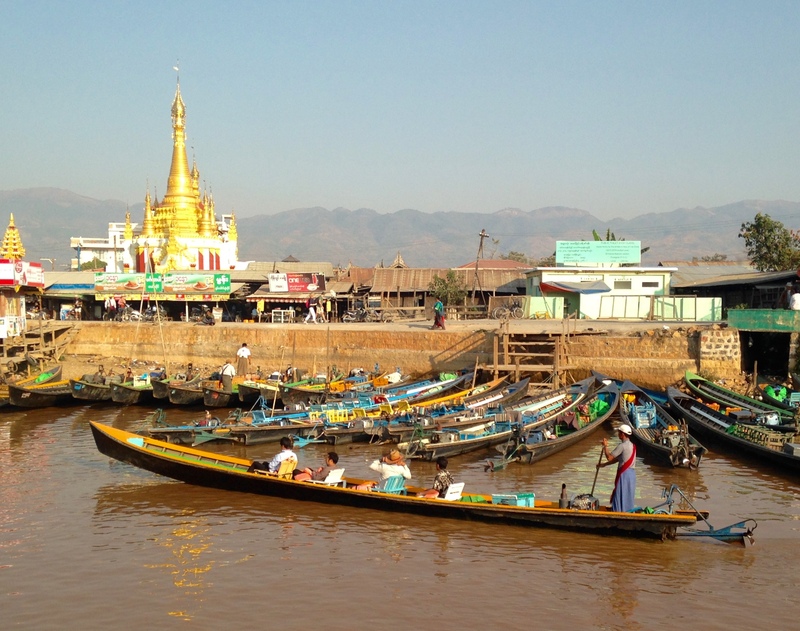 There, much to my surprise, I run into Sunoko, the Japanese lady from Shanghai who I met in Bagan, the one who was struggling mightily with her e-bike, just as I had. 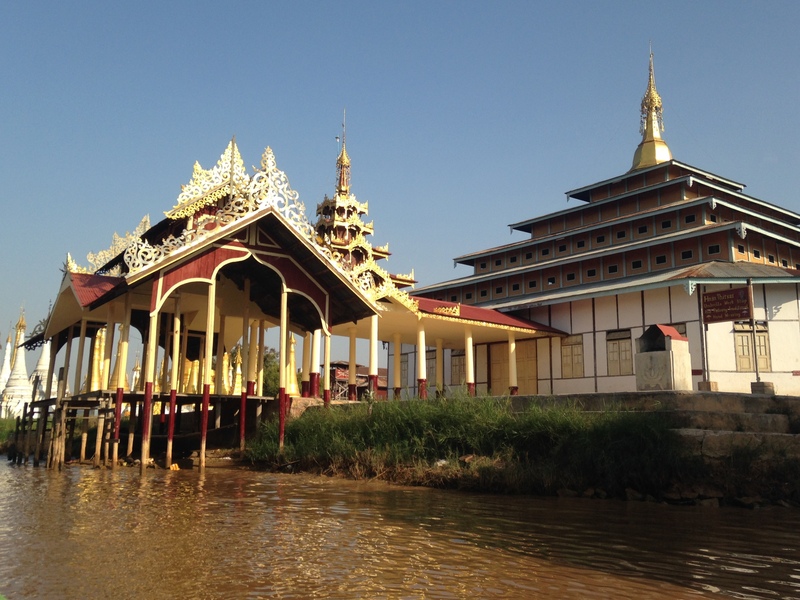 Although Myanmar is a small country, and the tourist route is quite similar for all tourists, I’m still surprised that I should run into her here at Nyaungshwe, a plane flight or a long bus ride away from where I met her in Bagan. 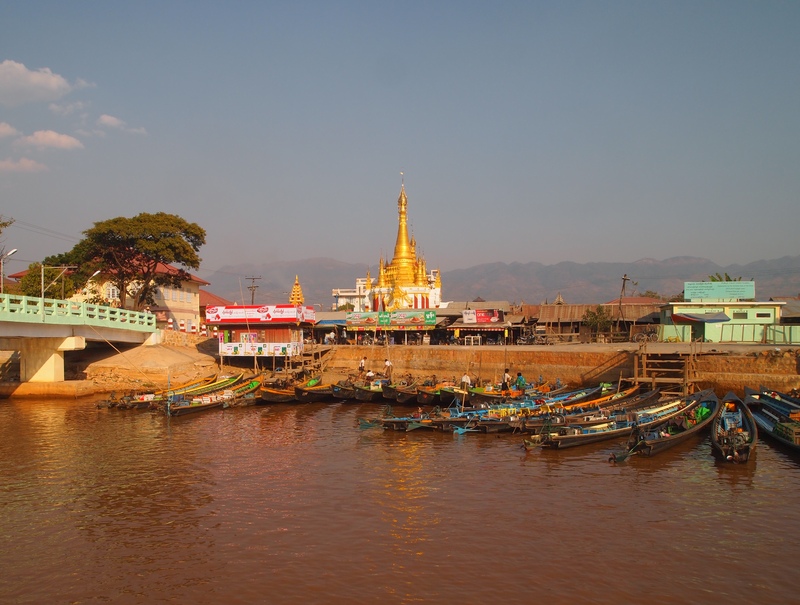 It turned out she met a group of young people in Bagan and took the bus with them to Inle Lake. 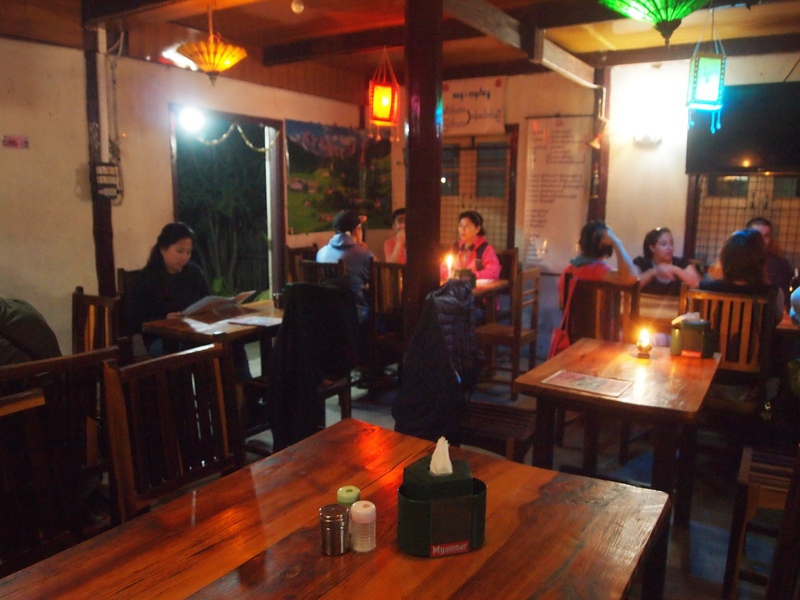 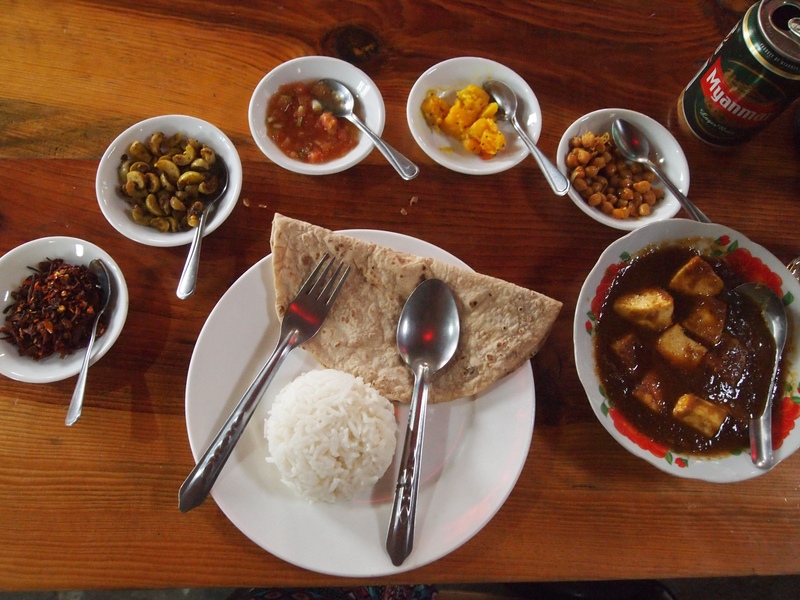 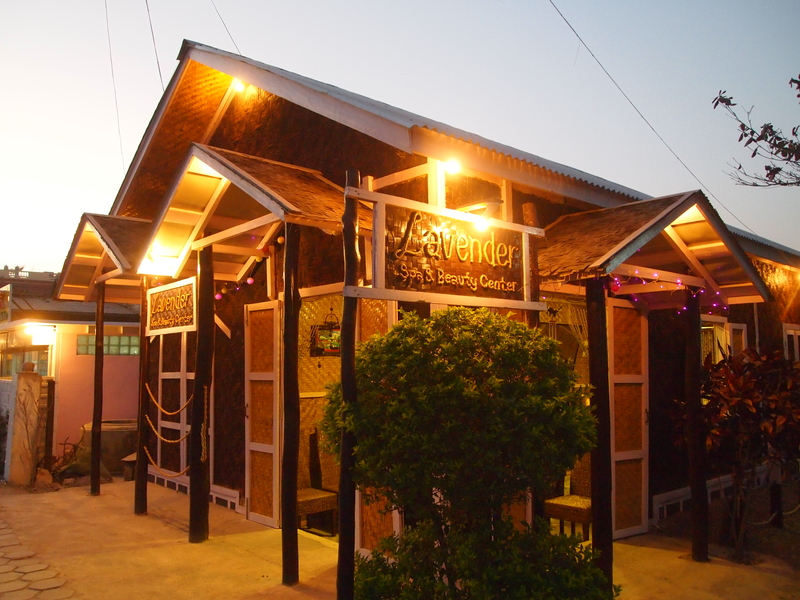 We chat for a while and then arrange to have dinner together tonight at 7:30 at Everest Nepali Food. 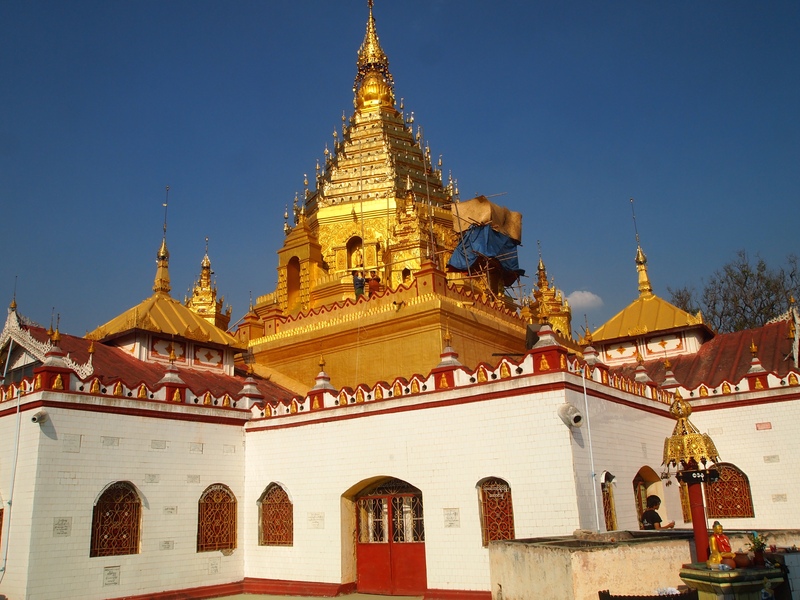 Yadana Man Aung Paya, a pretty gilded stupa south of the Mingala Market, is the oldest and most important Buddhist shrine in Nyaungshwe. 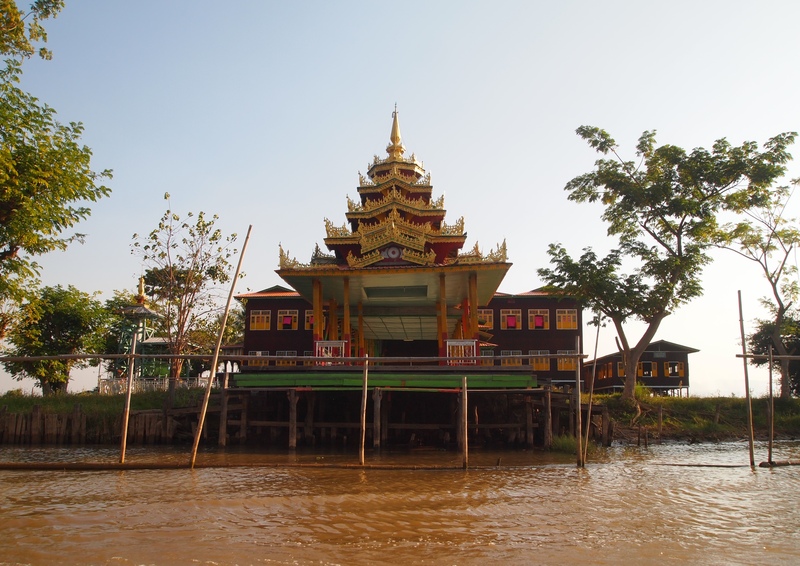 The pavilion on the grounds contains treasures collected by monks over the centuries, including lacquerware, carvings, and dance costumes. 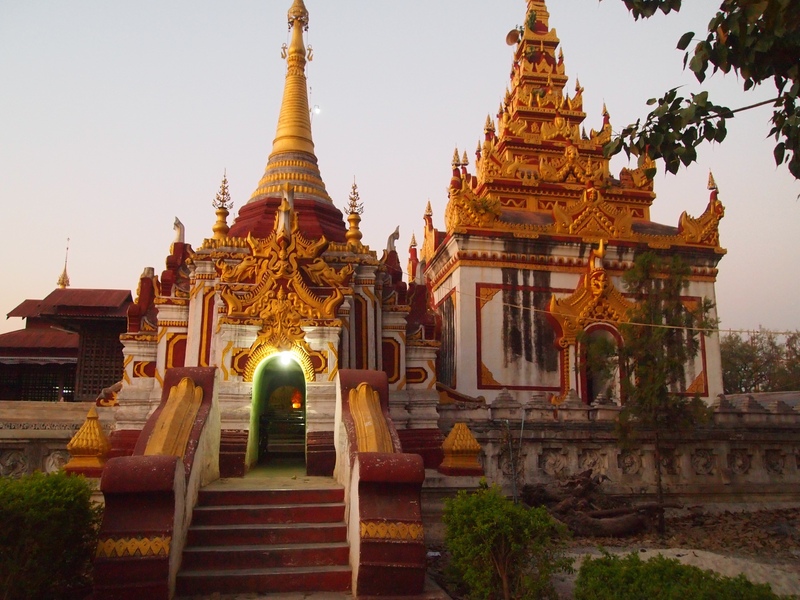 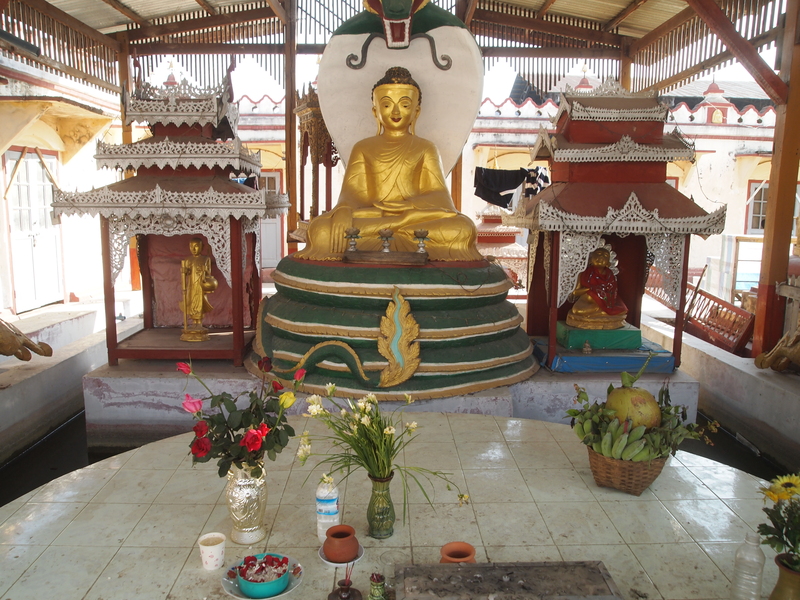 The stepped stupa is unique in Myanmar. 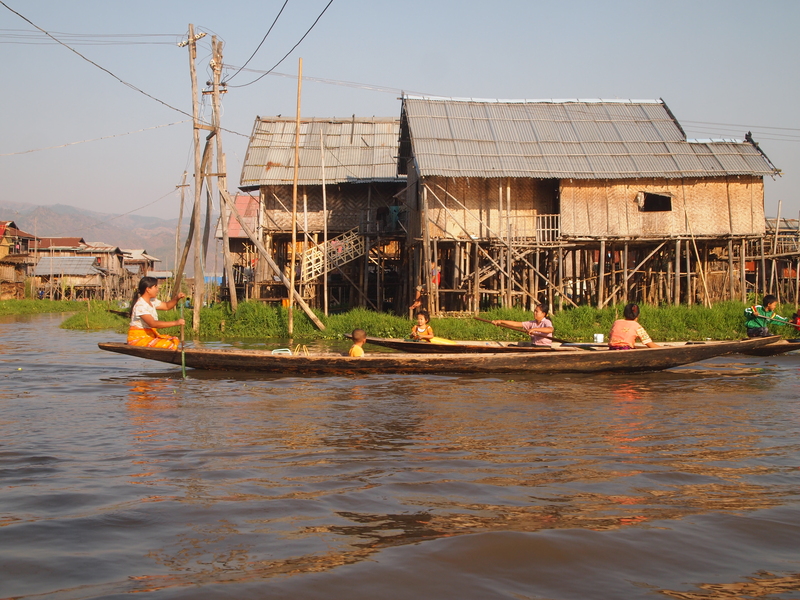 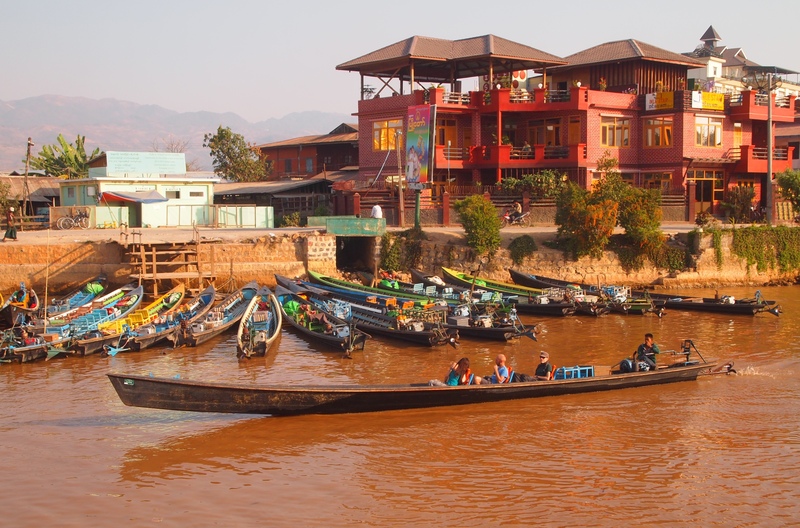 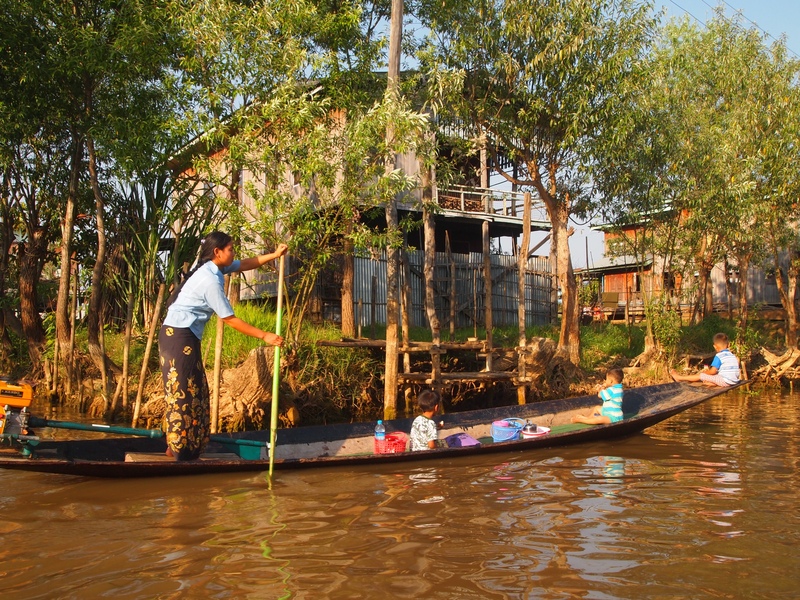 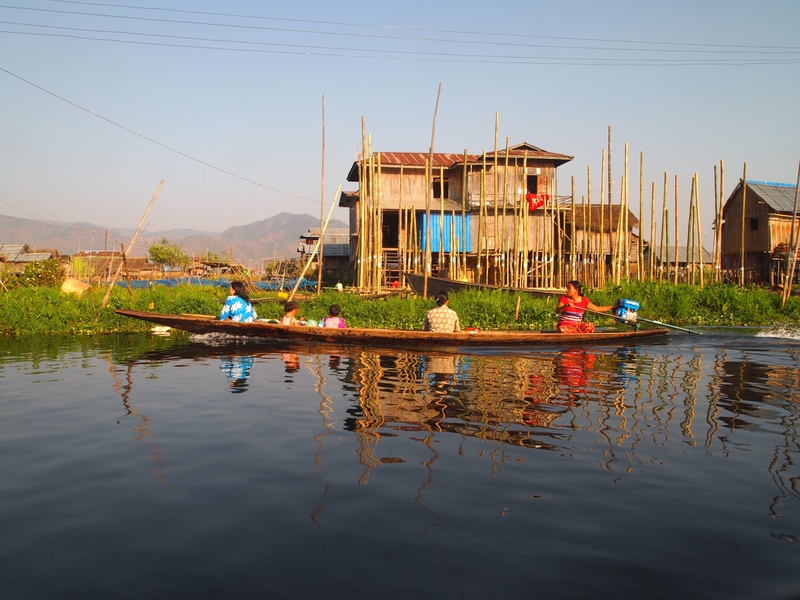 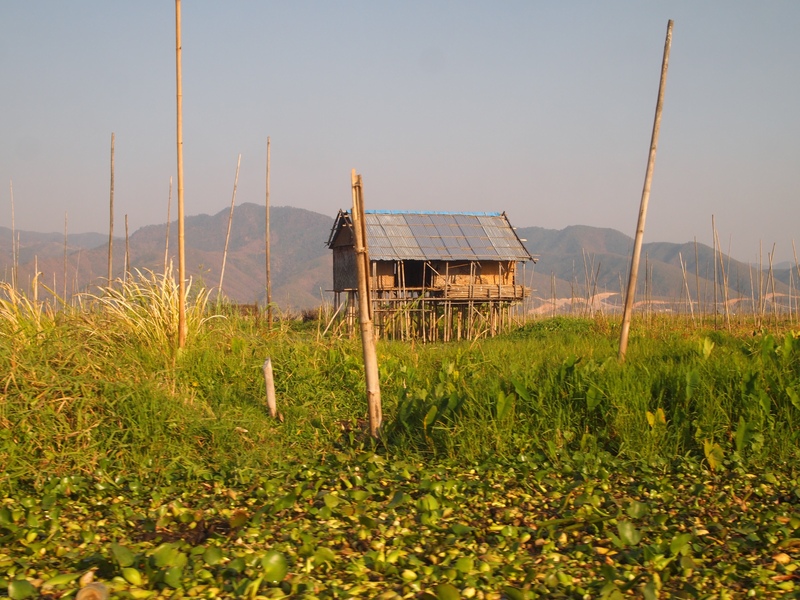 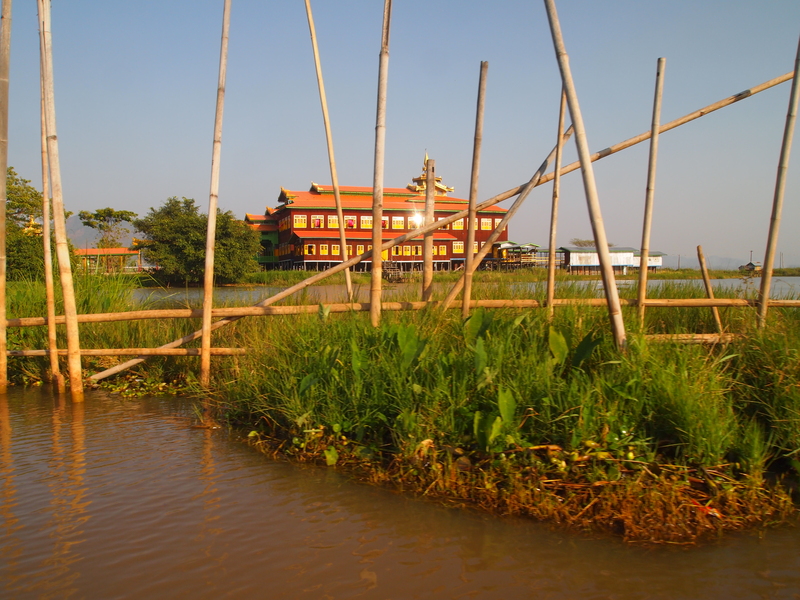 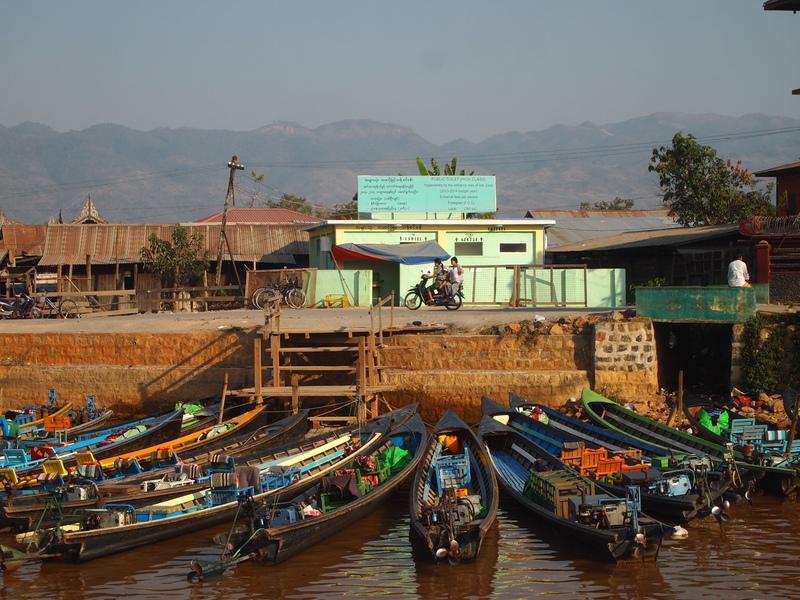 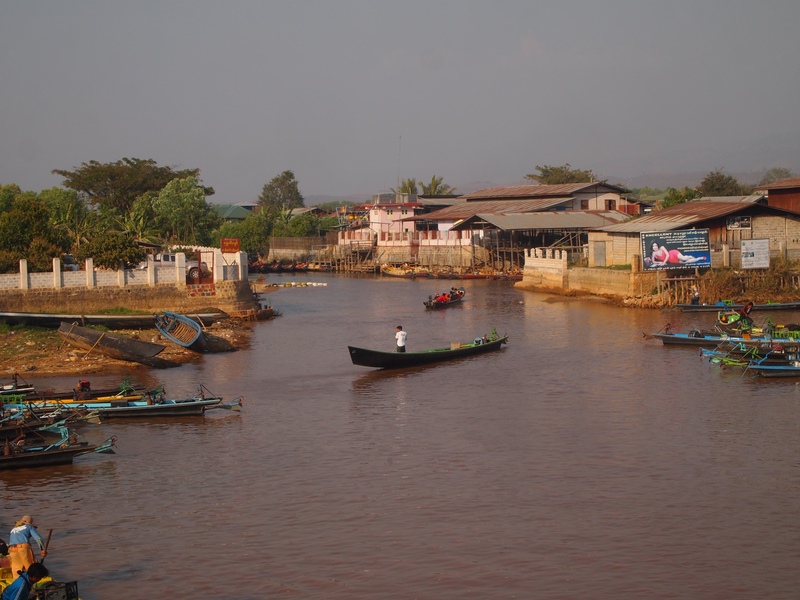 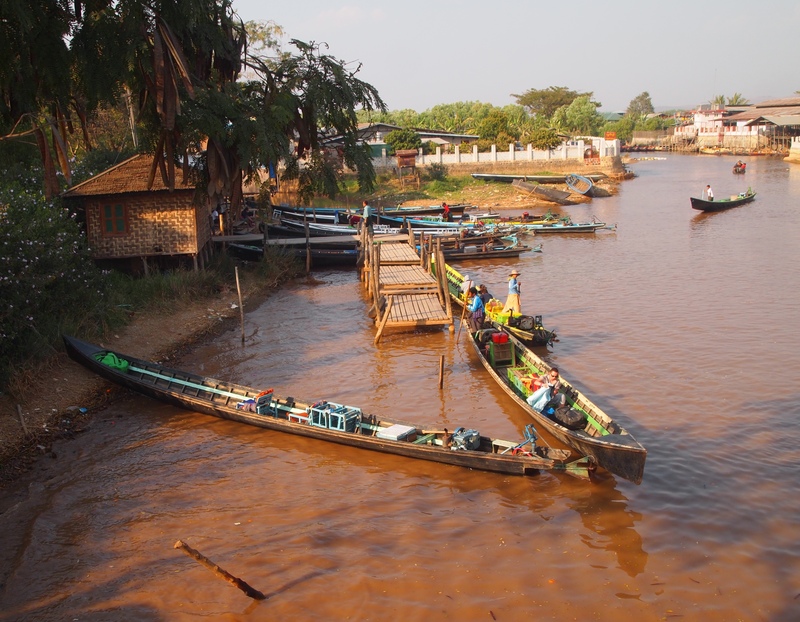 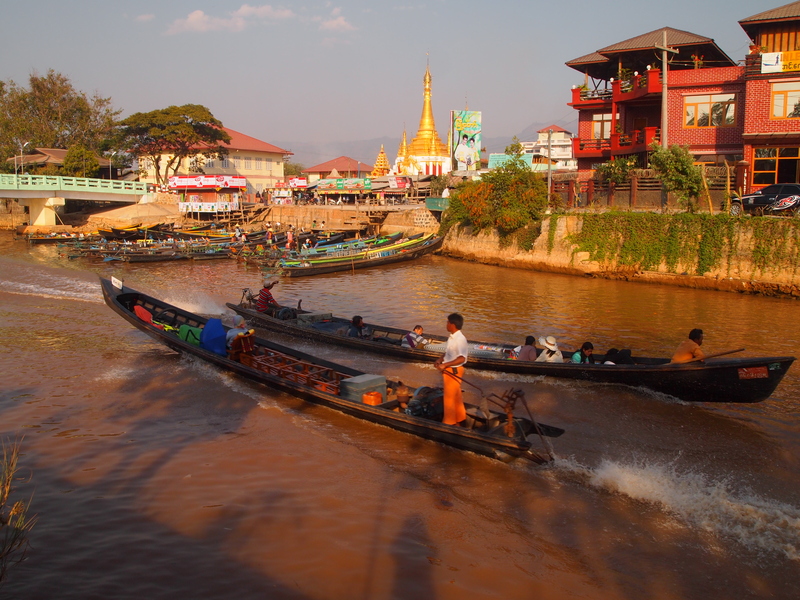 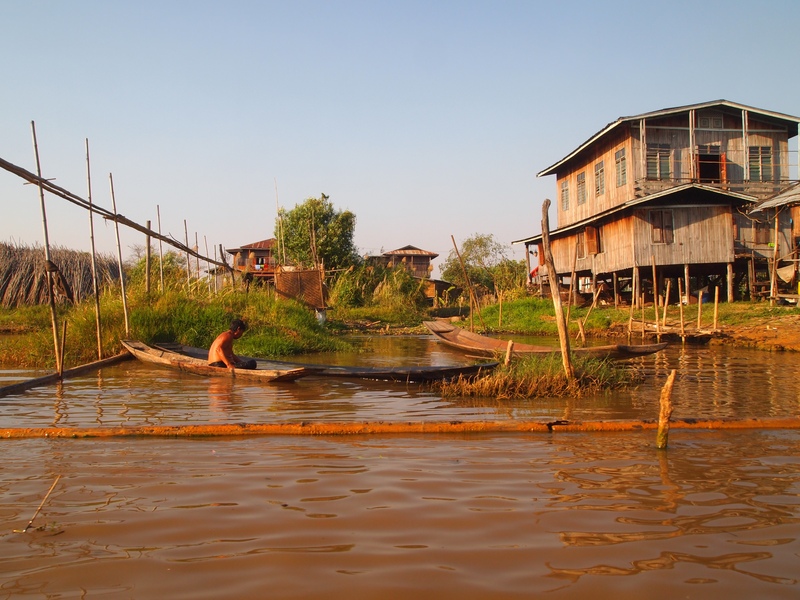 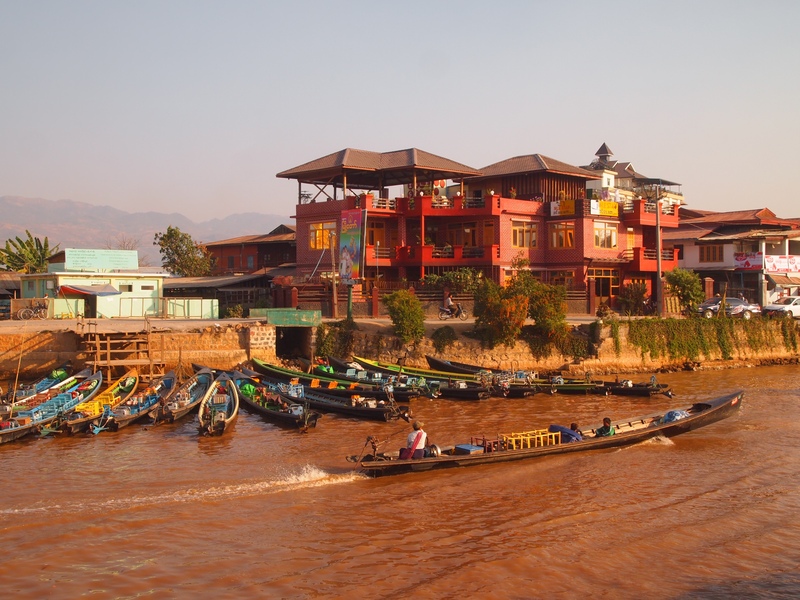 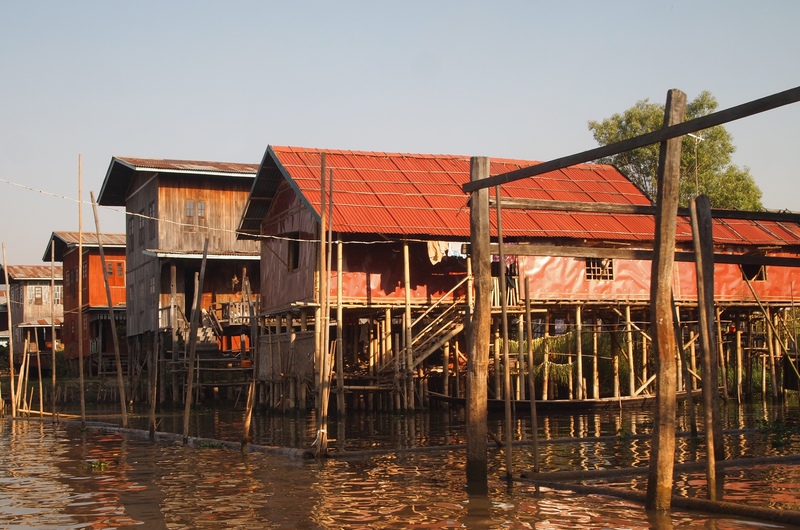 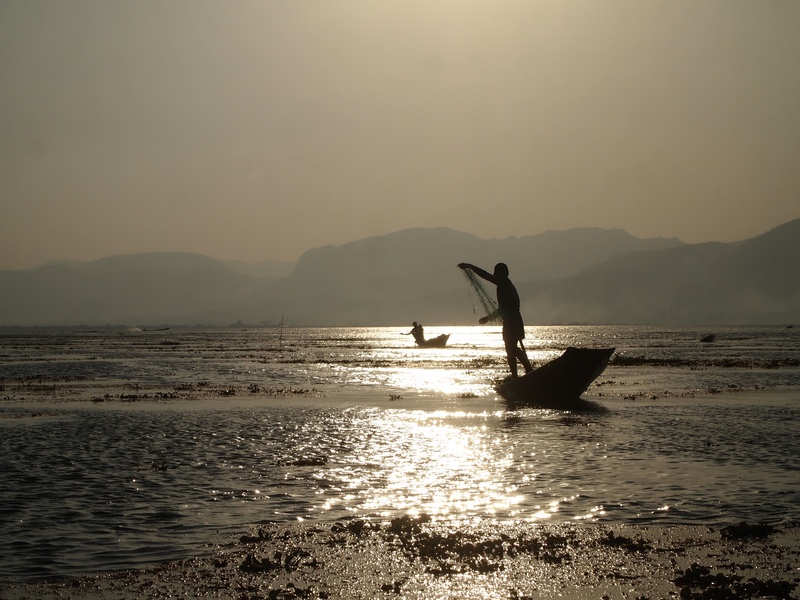 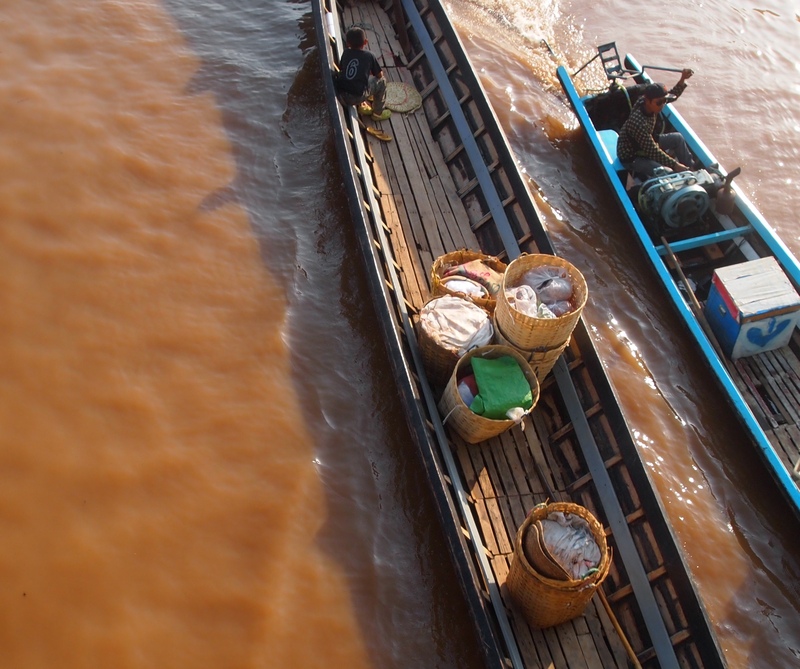 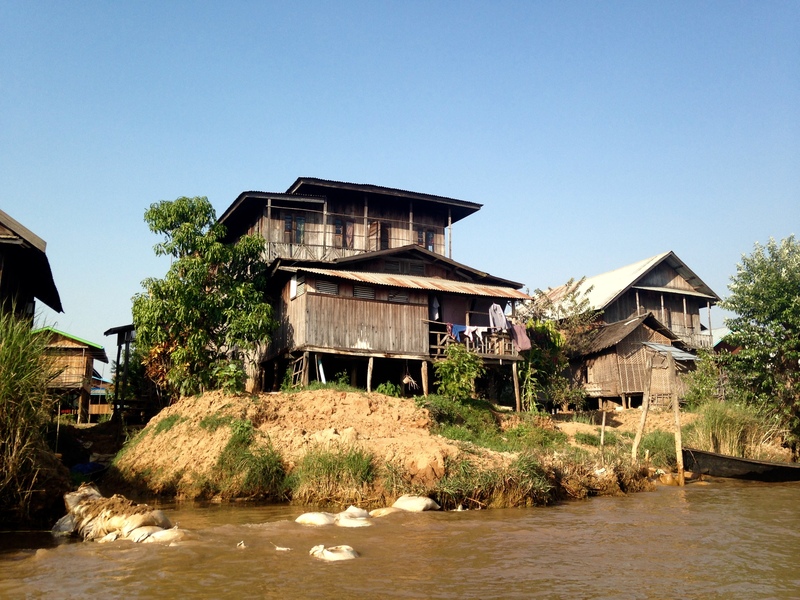 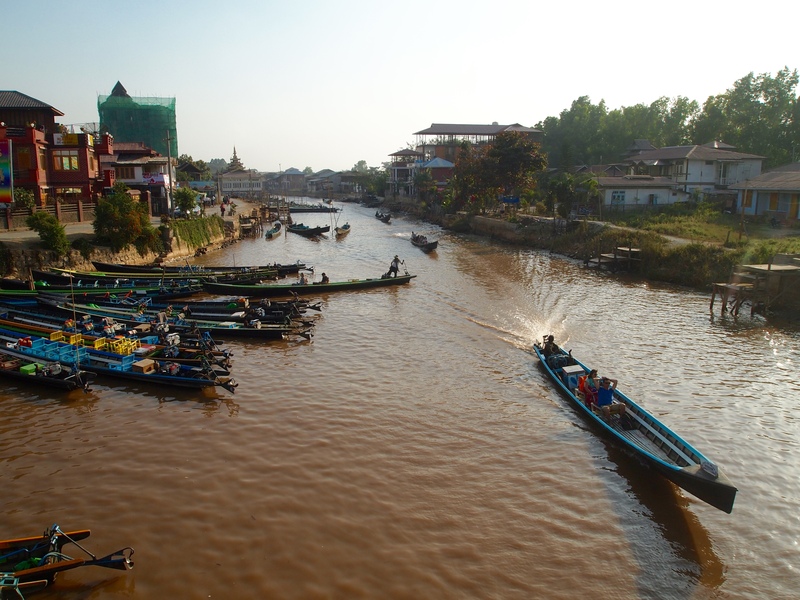 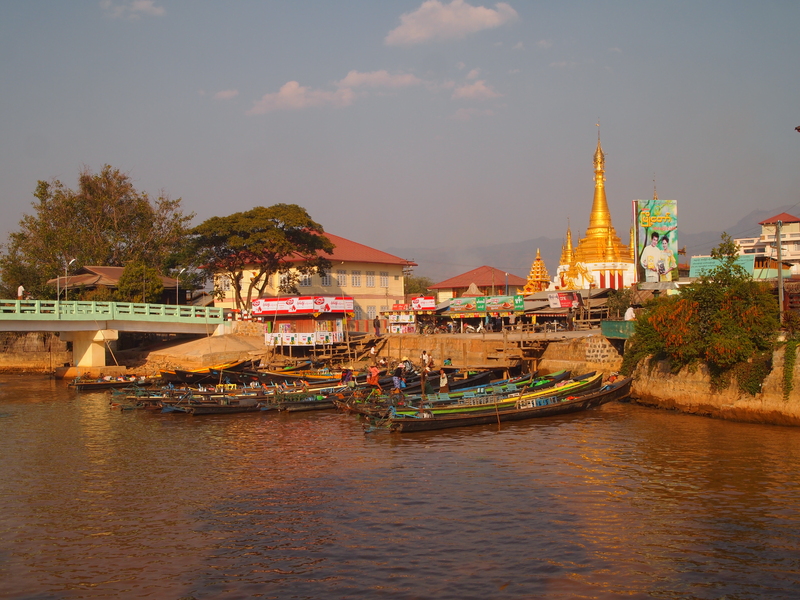 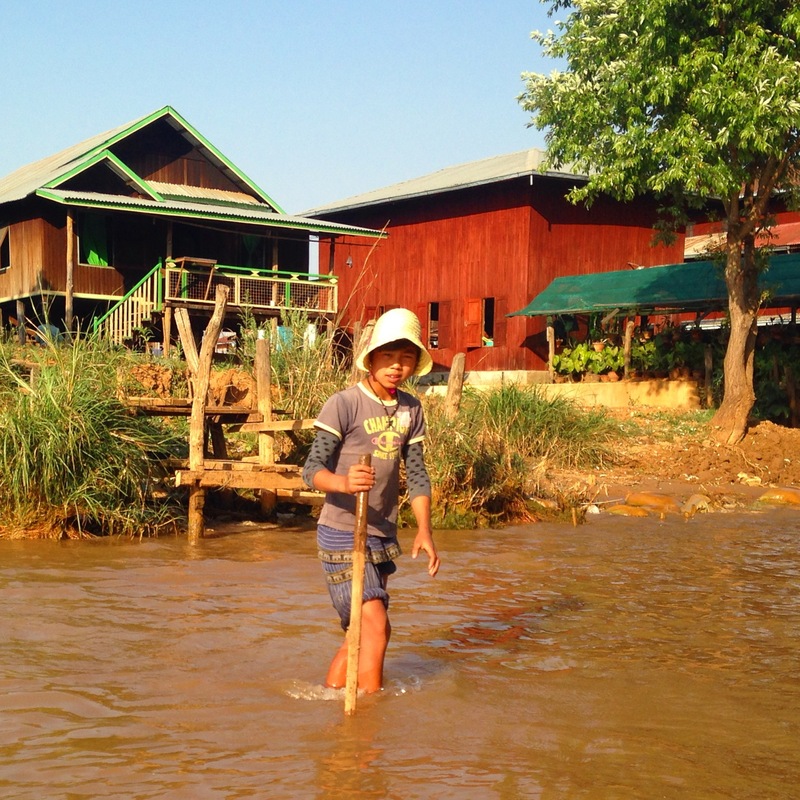 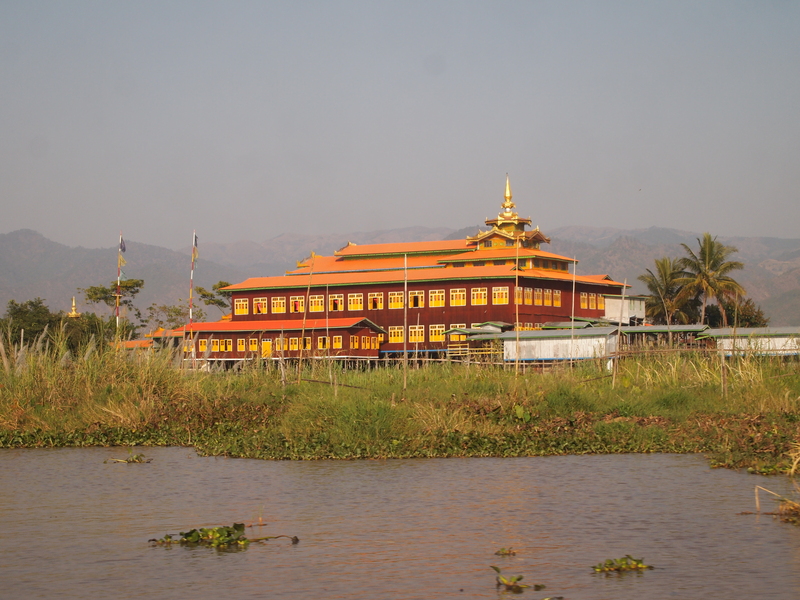 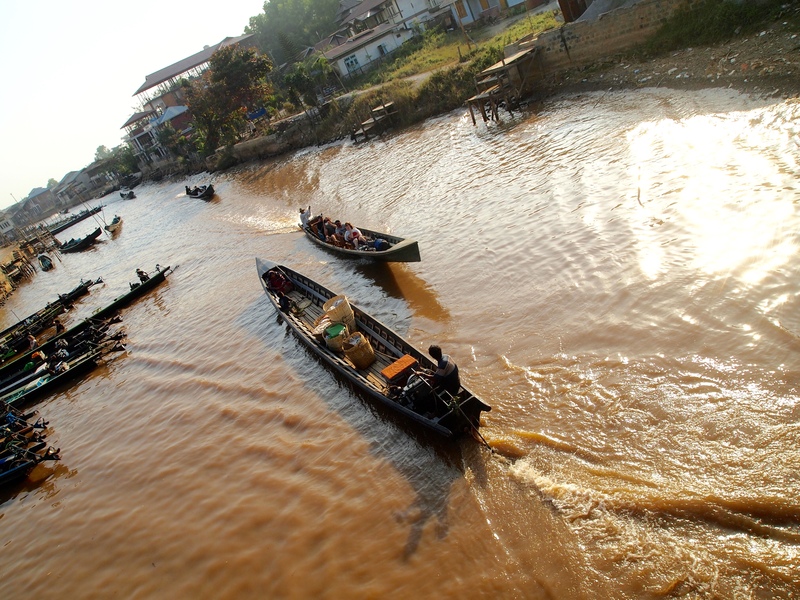 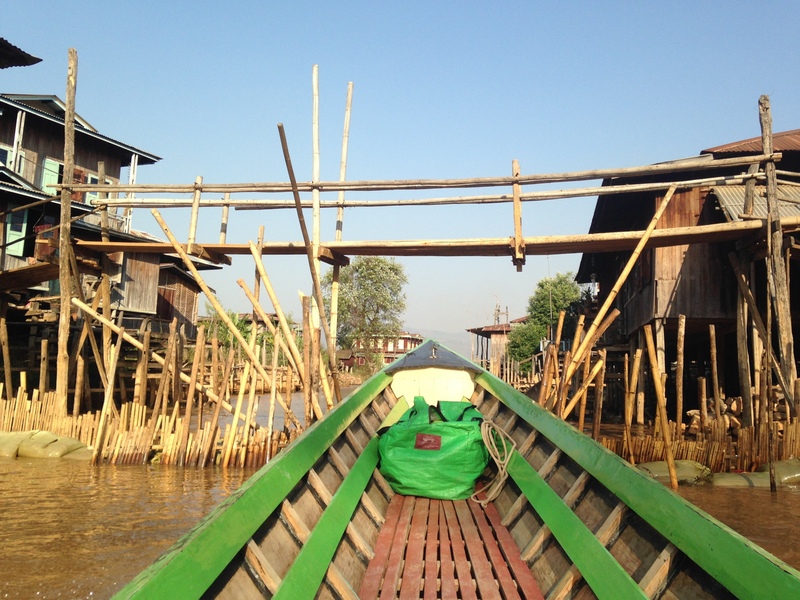 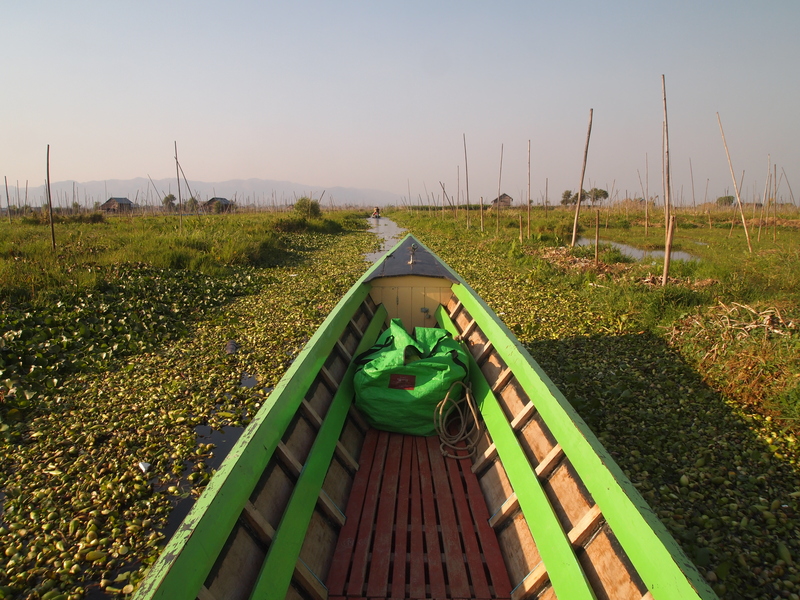 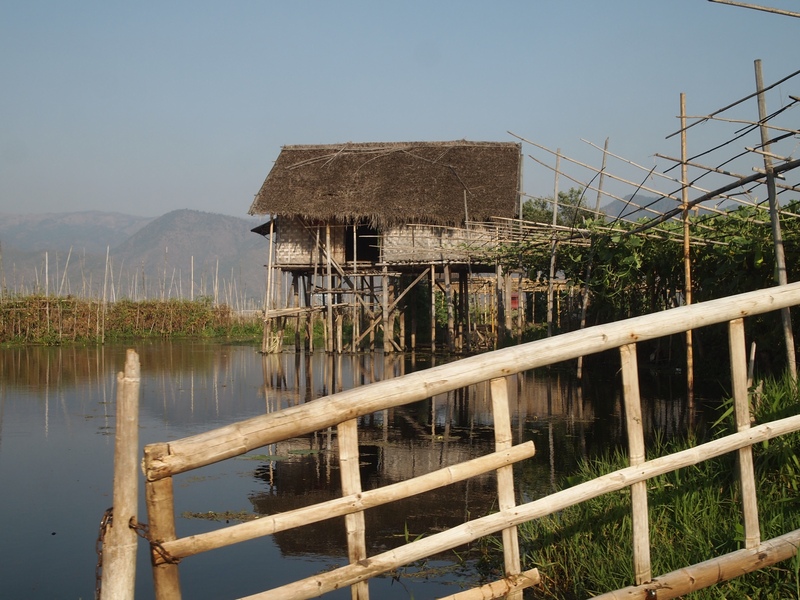 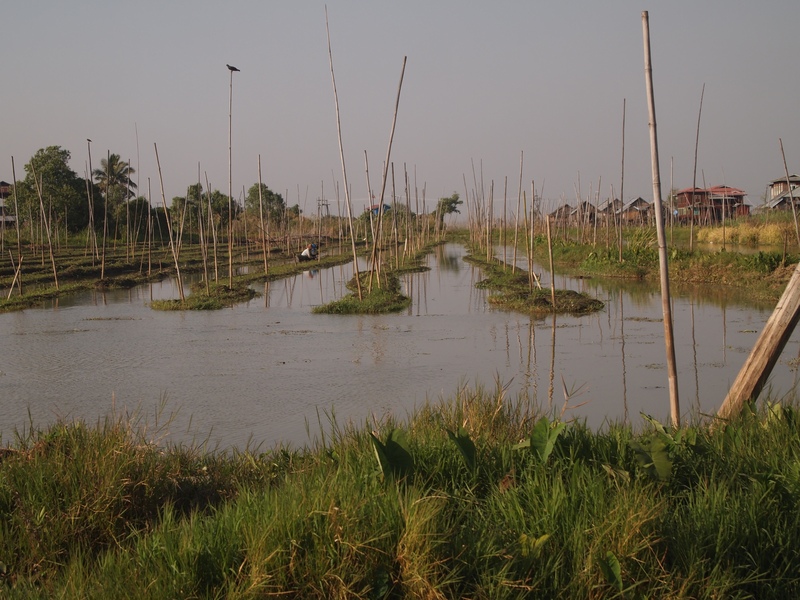 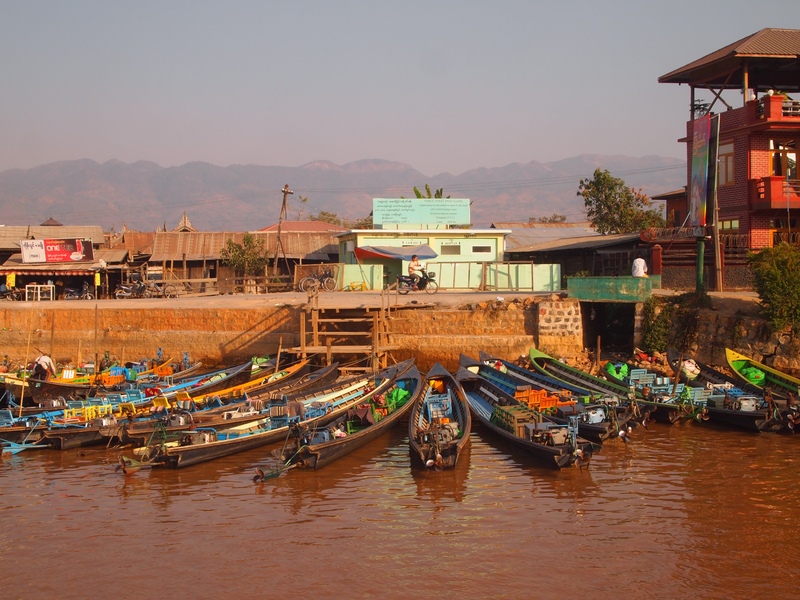 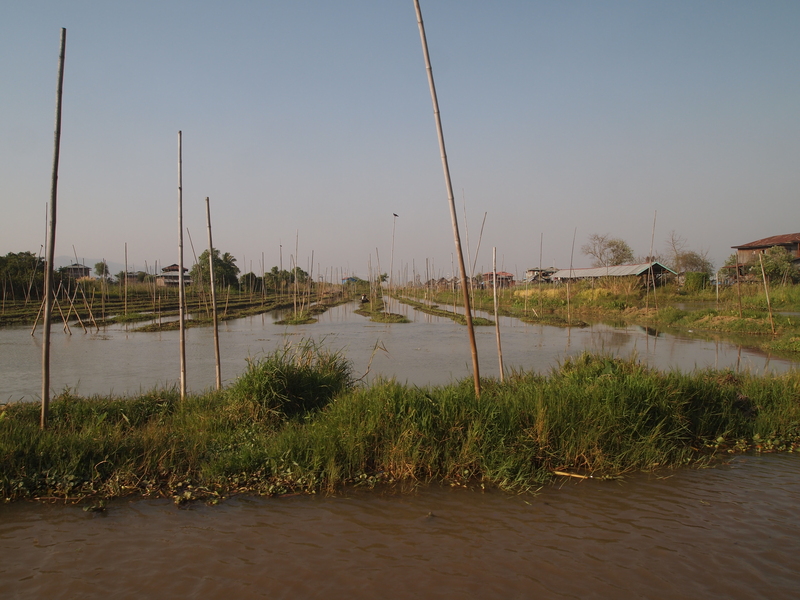 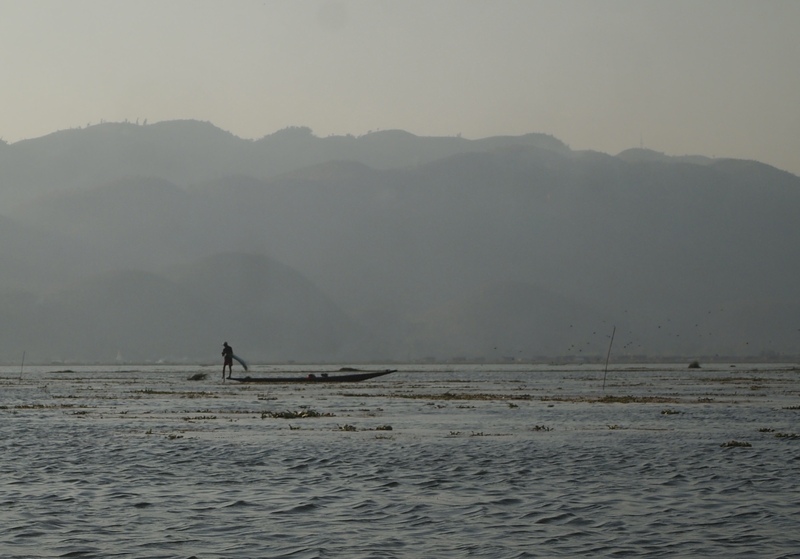 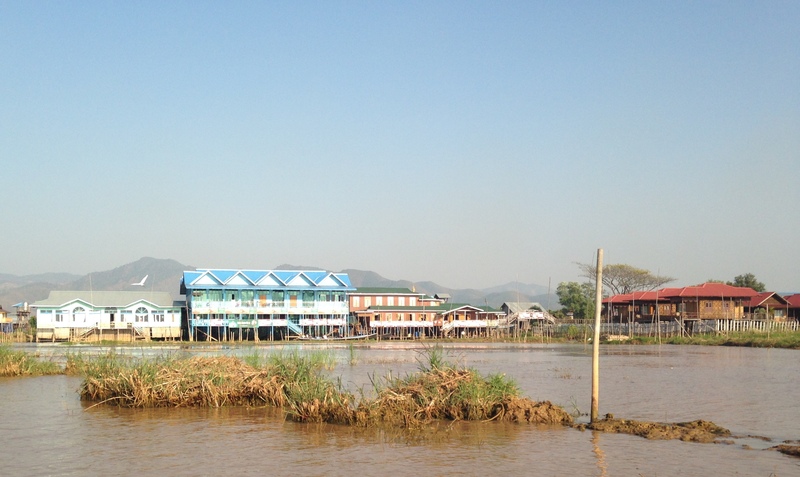 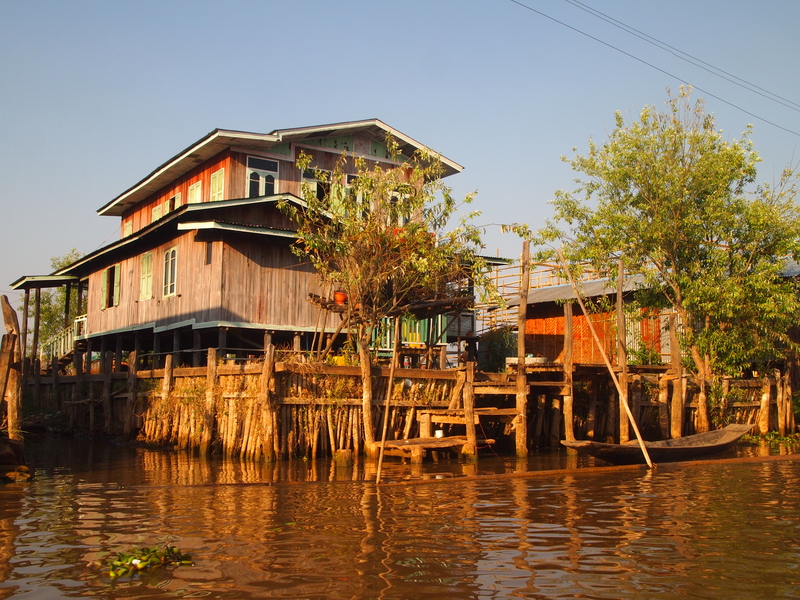 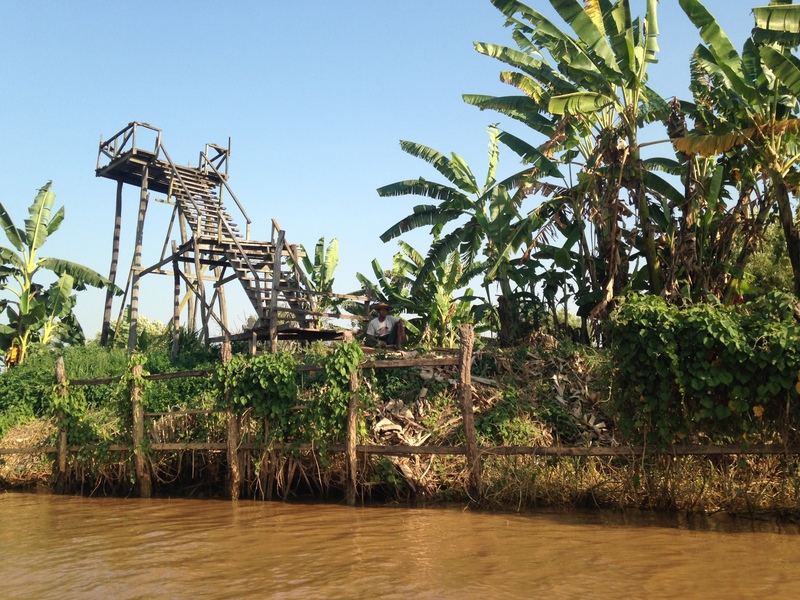 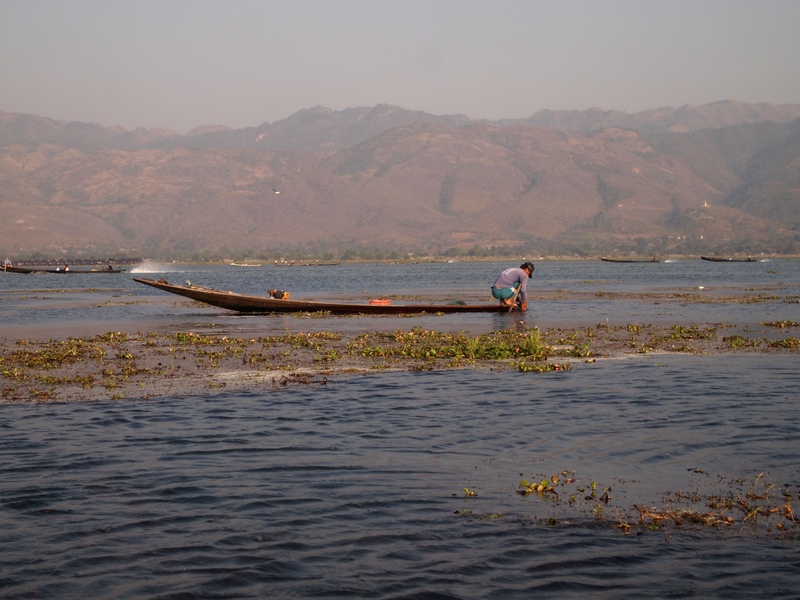 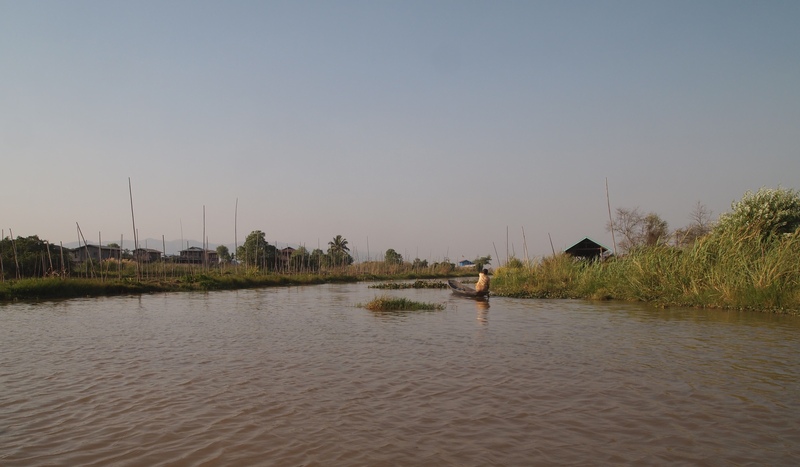 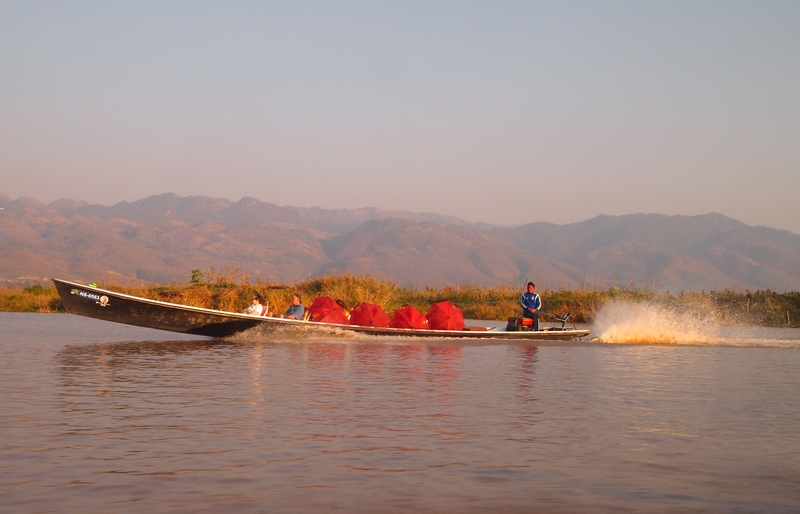 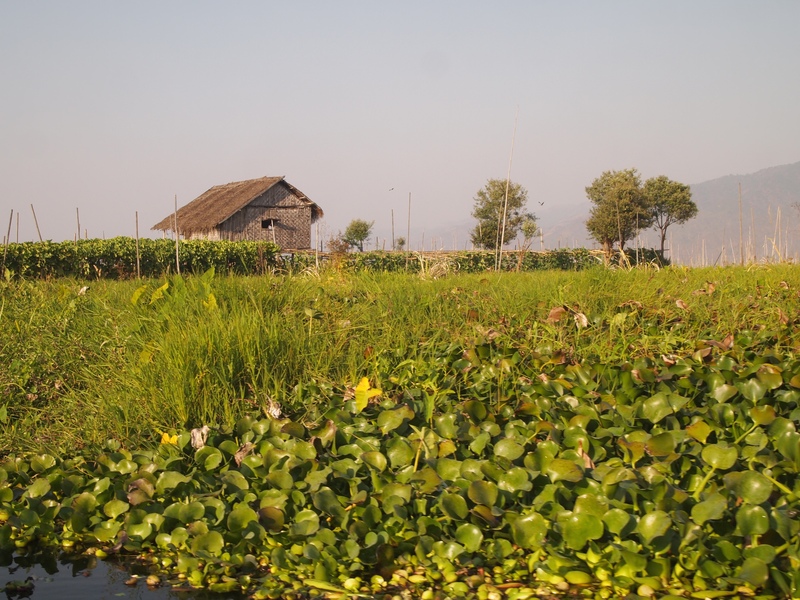 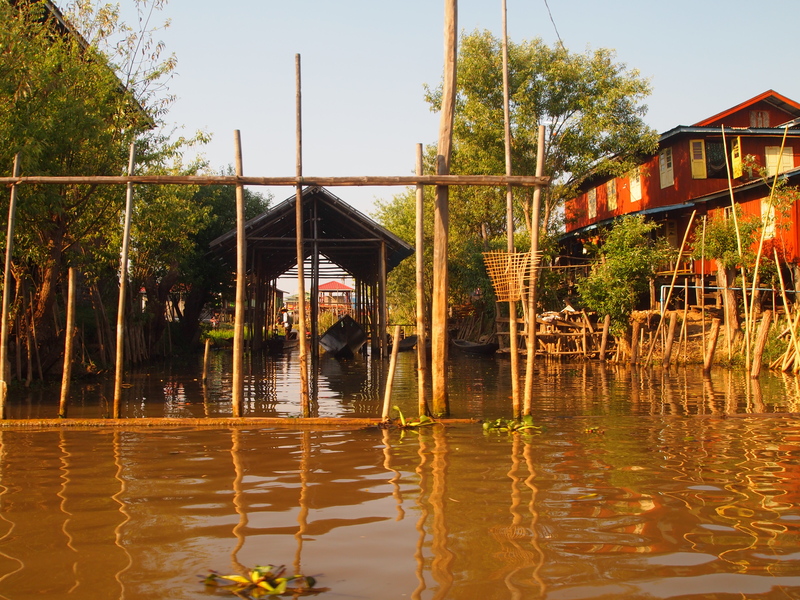 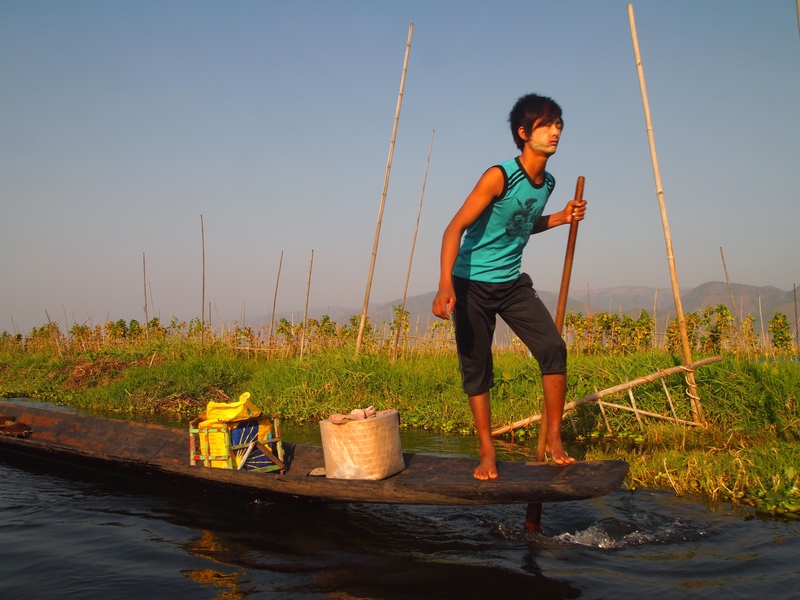 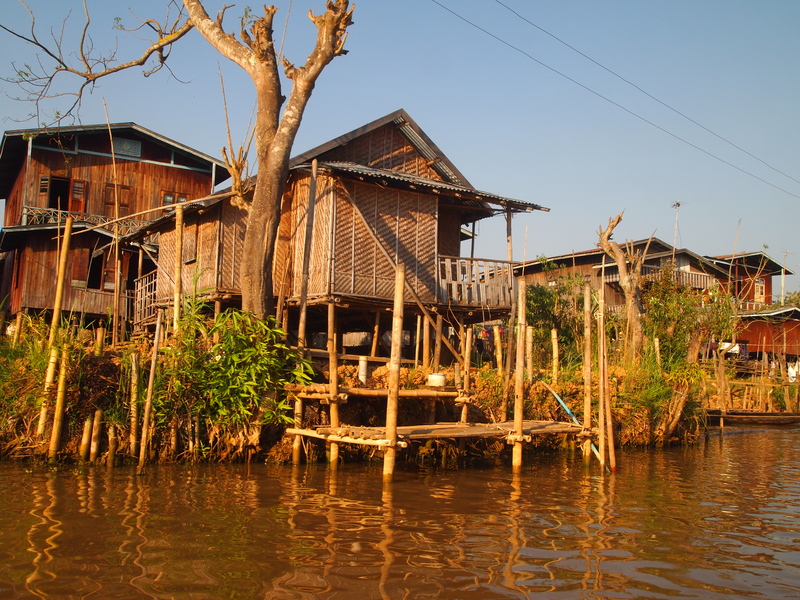 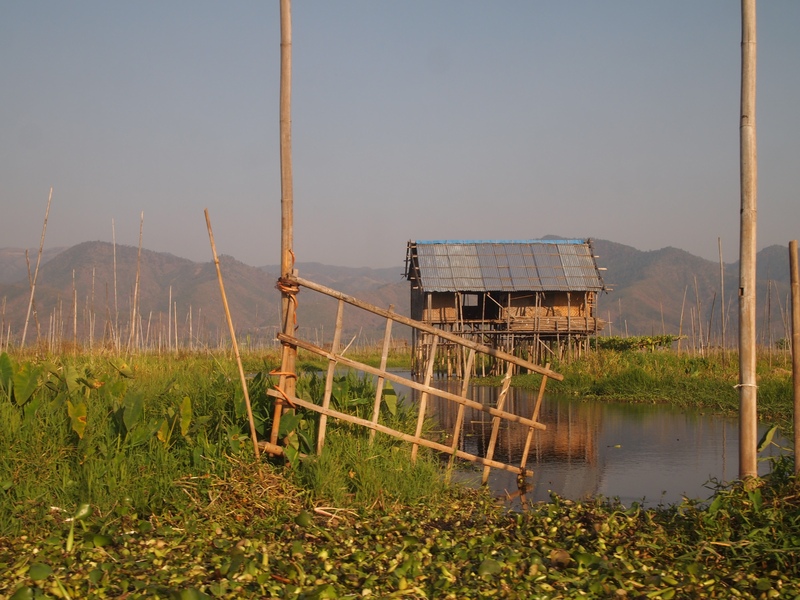 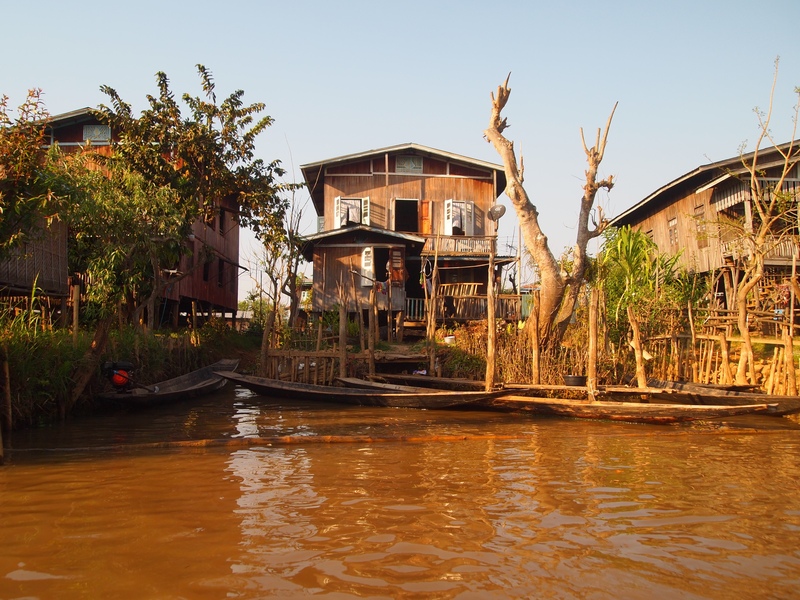 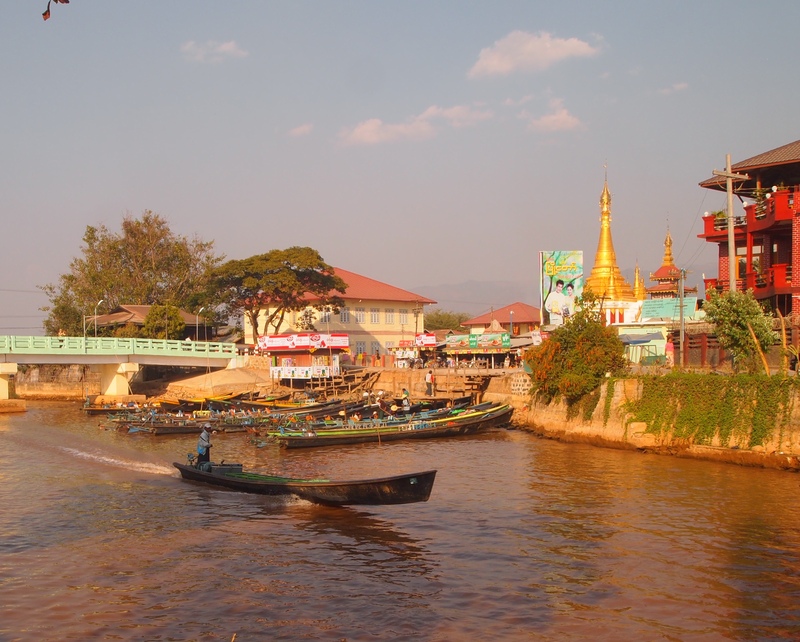 Nyaungshwe is the main access point for Inle Lake; it sits at the lake’s north end. 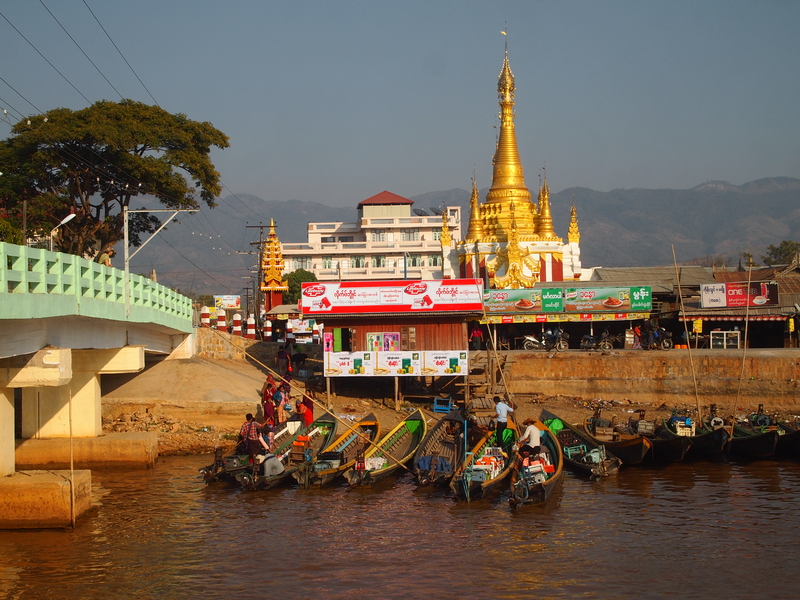 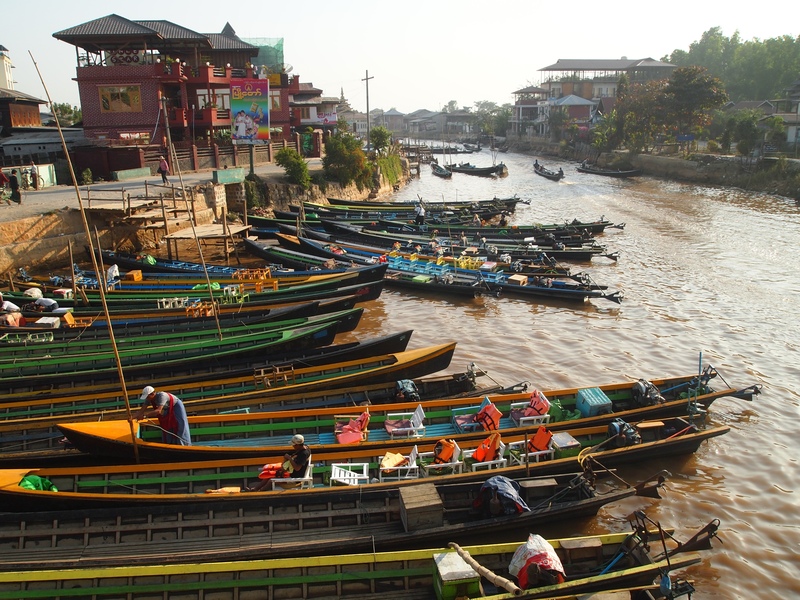 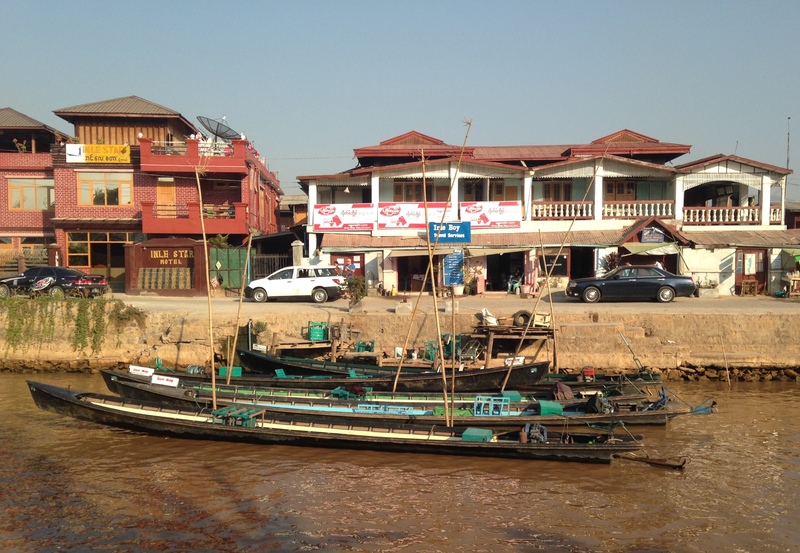 After exploring the pagoda, I walk along the canal and watch the bustle and buzz of the famous long-tail motorboats. 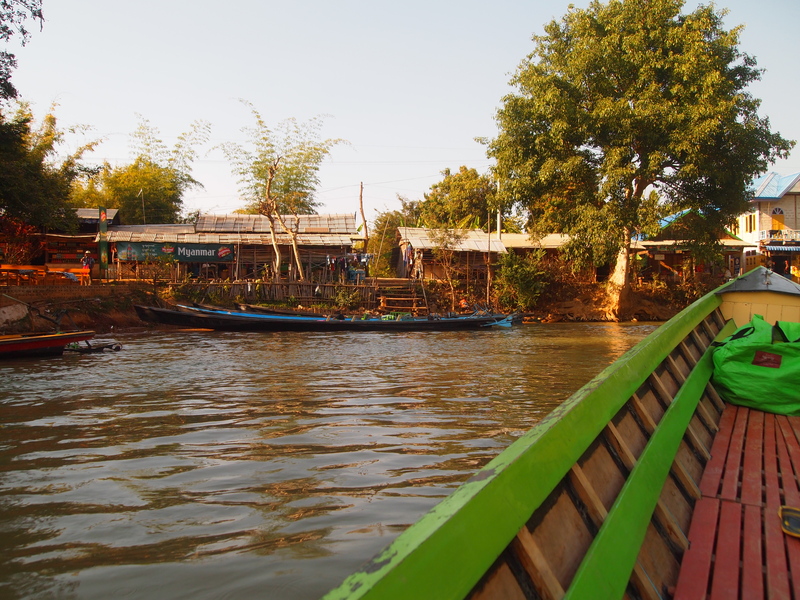 I love places like this that are a bit scruffy, but colorful and bustling. 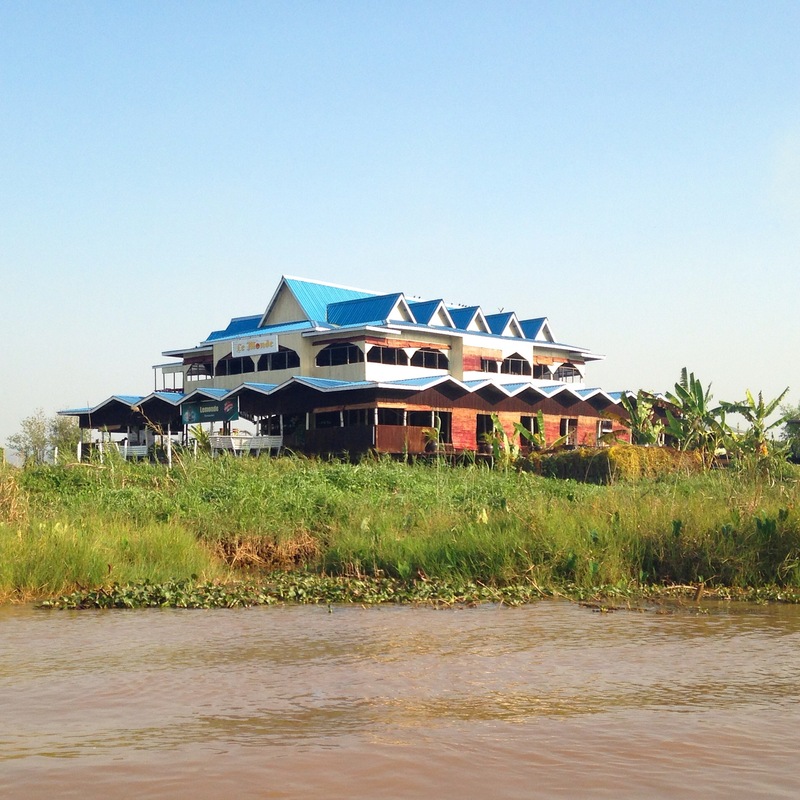 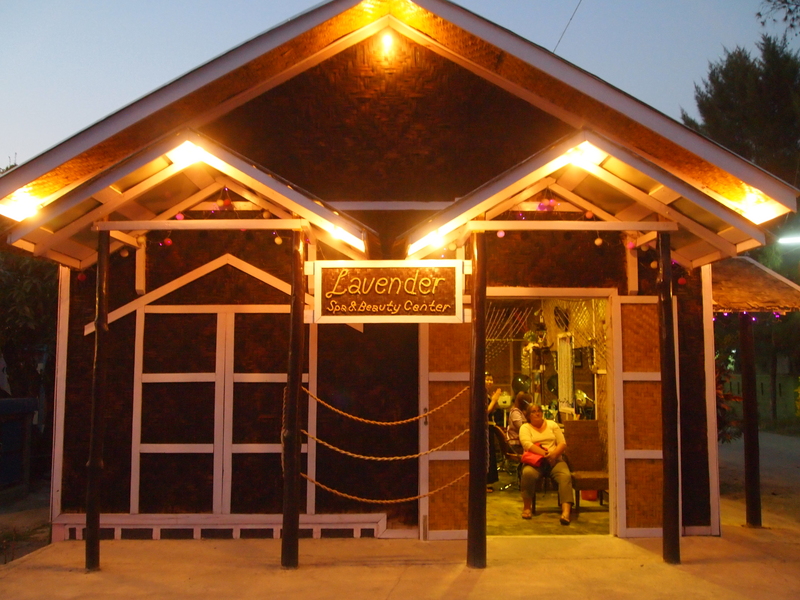 I go back to the Inle Apex Hotel to relax. 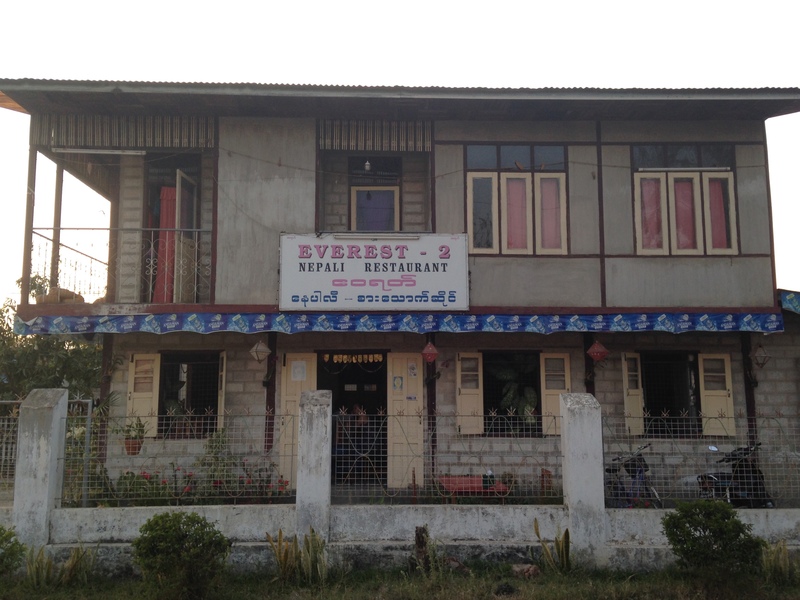 After a while, I go out to find Everest, where I’m meeting Sunoko. 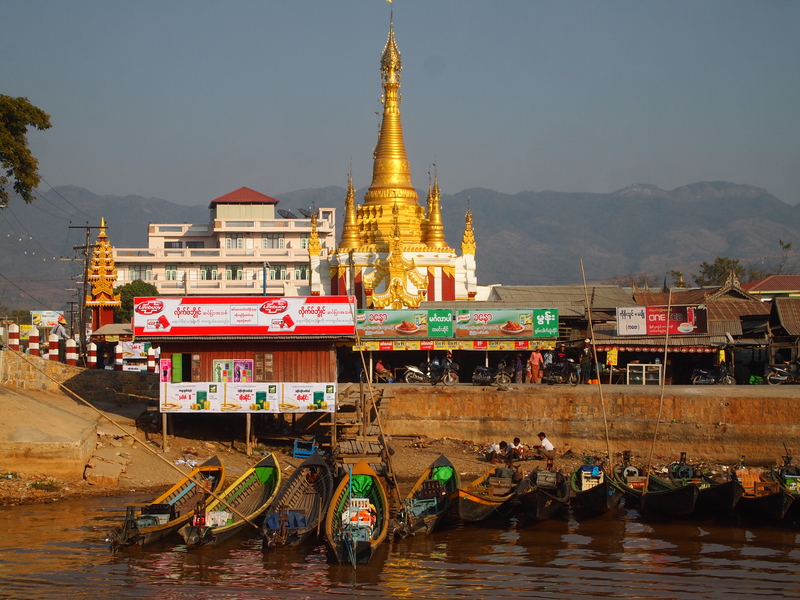 I arrive before she does, so I sit at a table and order a Myanmar beer. 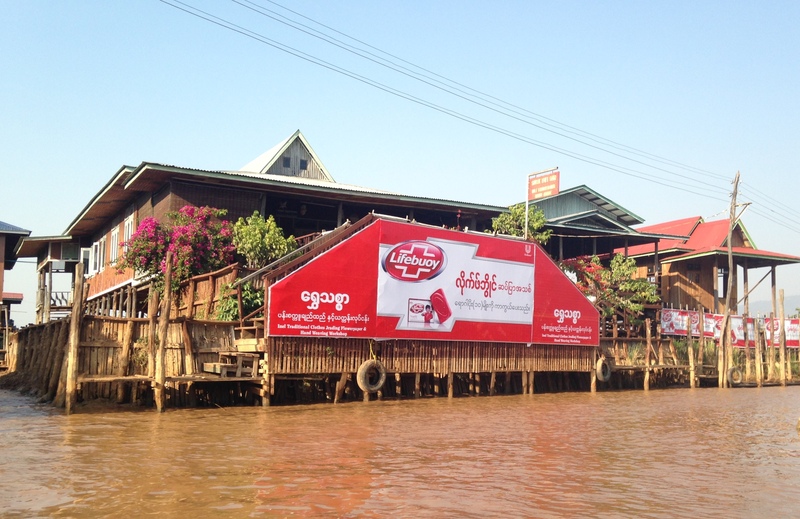 When Sunoko arrives, she orders a beer too. 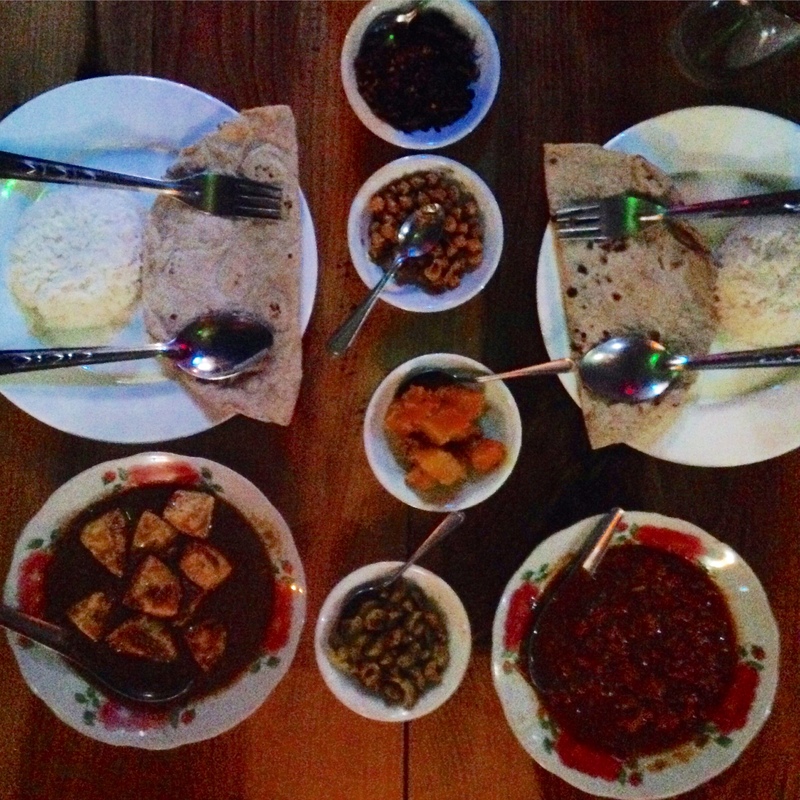 We both order some Paneer Curry that is delicious! 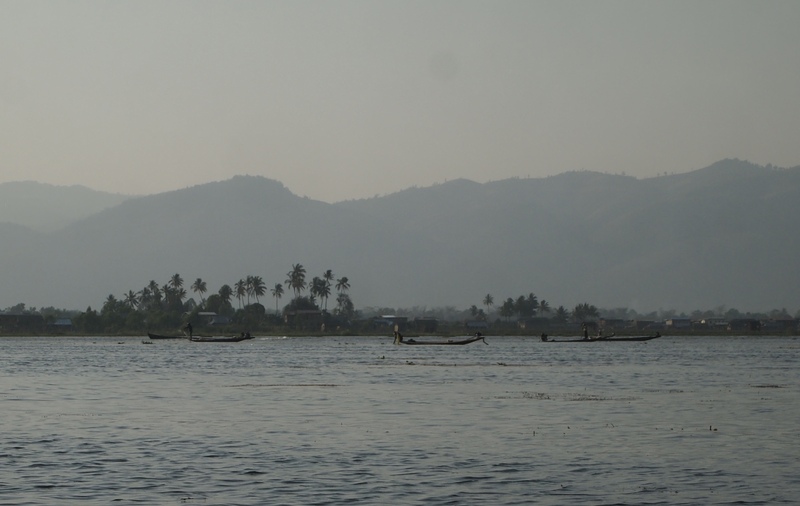 She tells me she’s 35 and really wants a boyfriend. 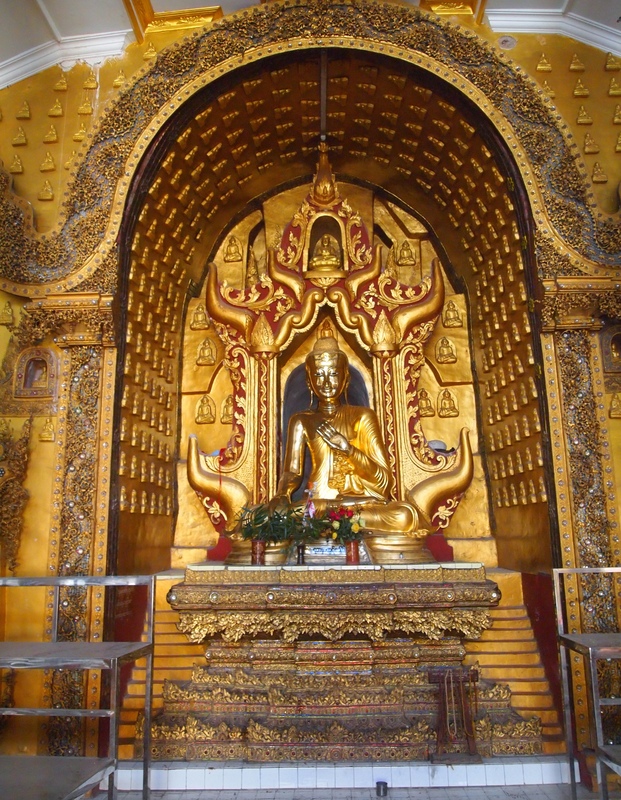 She tells me about a German guy she really likes, but he seems to only think of her as a friend. 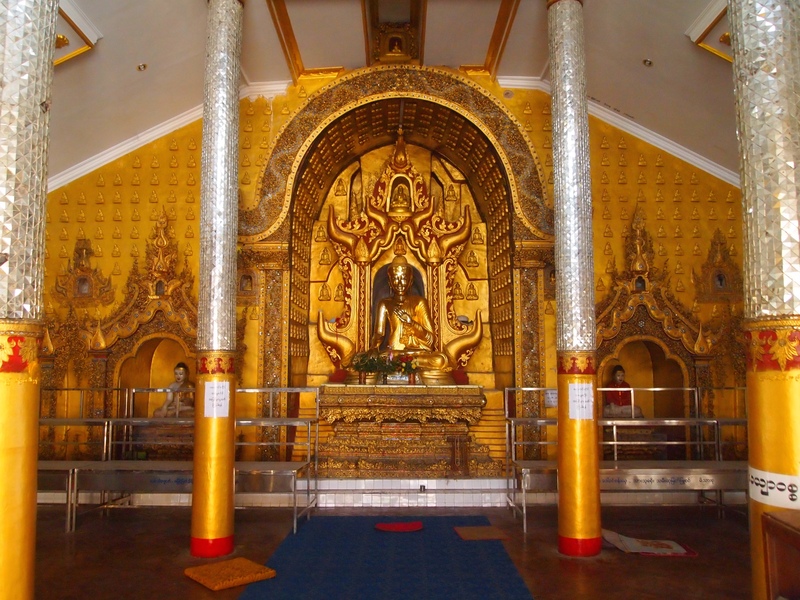 I tell her my daughter has been caught up on a guy she’s known since high school; she’s experiencing the same situation. 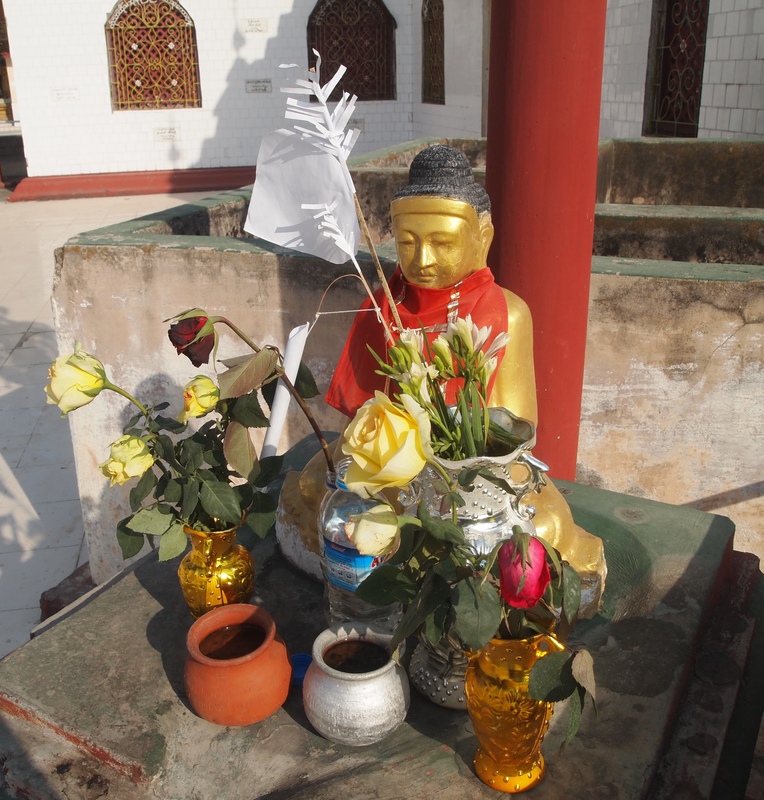 Unrequited love is the worst!